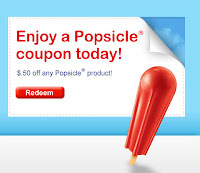 Rare $0.50/1 Popsicle Product Coupon + Popsicles for Life Sweepstakes! Head over to Popsicle's Facebook page to print out a $0.50/1 any Popsicle product coupon! Plus while you're there, you can enter their "Win Popsicles for Life" sweepstakes....could you imagine? !